I have heard of sci-fi conventions before, I knew there were cons not just for Star Trek, but for “smaller” shows, like Buffy as well, but since I live in a country where fans of sci-fi and supernatural shows are considered rather weird, I didn't go to any convention myself. 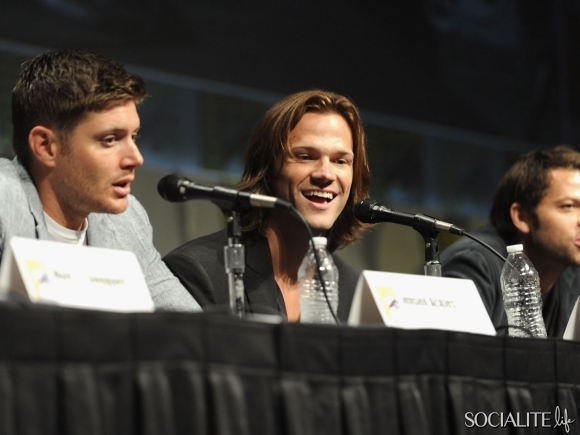 Besides, all these cons were outside the country I live in and I didn't know any other nearby fans. 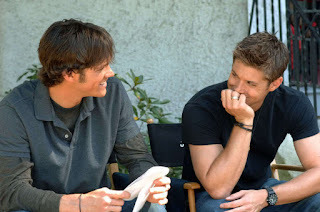 First it was the J2 photo shoot. When we entered the photo studio room, I saw both guys sitting on a chair, deeply involved in a conversation. The photographer had to tell them to stop talking and asked if they were ready for the photo every single time a fan stepped to them. They looked like they wanted to be somewhere else where they could be alone and able to talk. Back then, I didn't know why, but on Saturday, Jensen said he spent the last 2 weeks in Europe while Jared was in the US, and he arrived only a few hours before the convention. Then I looked at Jensen because I saw him looking at me. He said, "Hi, how are you?" He was eyeing me up, from toe to head and back. I noticed he checked out my left hand with my engagement ring on it. His hands were on his thighs and he was just about to remove his left hand and starting to reach for me (I guess he wanted to pull me closer, I was standing one or two small steps away from them) when Jared looked at him and he cleared his throat really loud. Suddenly Jensen put his hand back on his thigh, his smile faded and the photographer said, "Guys, okay?" 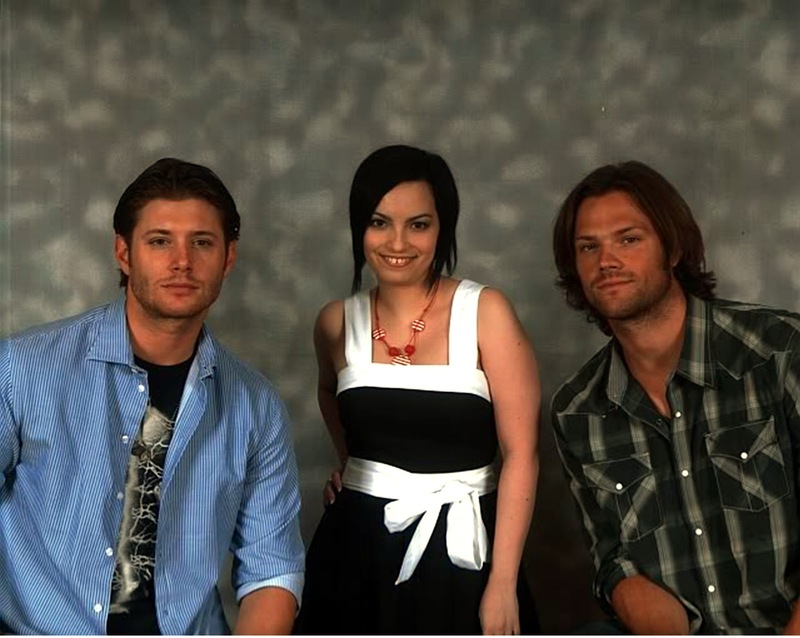 Jared leaned a bit closer and the photo was taken. 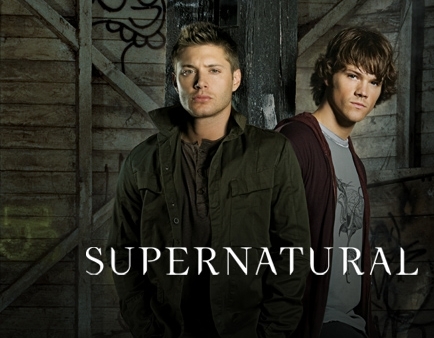 I thanked them and walked away but I looked back at them as I picked up my handbag from the desk and I saw Jared looking at me with an angry face. After the photo session, the J2 autographs were up next. Since I received that request about daring to get this "t-shirt signing" photo signed (my fan friends said I would chicken out since it was an unofficial photo), I was really excited about the whole autograph session. I was queuing up really early and I told my Jared fan friend to go first so she can get her Jared autos while I receive my Jensen ones. The staff was really unorganized, and they took my autograph tickets at the entrance instead of having them taken by Jared and Jensen's assistants. So, when I was up next, Jensen looked at me, gave me a huge smile (Jared was sitting 2 meters away at another desk, still signing for my friend) and said, "Hello again." Jensen smiled at me again and said, "I'll wait." I walked back to him (I was wearing high heels, so it was a slow walk) and then put the J2 photo in front of the assistant. She looked at it and said, "Uh-oh." Jensen took it out of her hand and at first, he didn't know what it was. I said, "Please don't refuse signing it. It was a dare." Then he chuckled and said, "Well, I can't say no to a dare, can I?" He looked at the photo again, took the silver sharpie in his hand and signed it. Then he signed the other photo as well. As he handed the autographs back I told him, "It was a funny moment, wasn't it?" and I pointed at the pic. He answered, "Right, it was really funny." Then I said, "Thank you very much and have a nice weekend!" He answered, "Thanks, but YOU have a nice weekend too!" Want to read a great fangirl story? 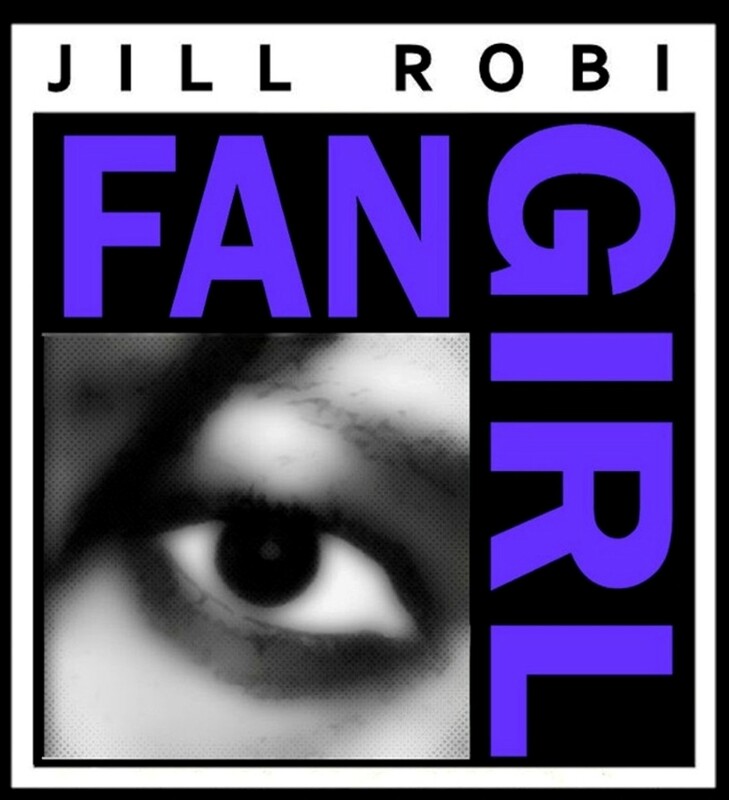 Check out Fangirl--available on paperback and Kindle!